Oh, Kitchener Stitch. For some, you are the epitome of agony. After countless seamless sweaters, I feel that I have finally gotten this underarm-weaving stuff down. Sometimes people refer to it as grafting, as well. That said, it still takes me a while to do it, and I did such a good job avoiding finishing work this summer that I ended up with three sweaters in need of all this work! Here's the thing about Kitchener Stitch, though: it's really cool! With a tapestry needle and some extra yarn, you almost magically weave together two pieces of fabric so that you can't tell where one ended and the other began. If you want a really in-depth look at Kitchenering, be sure to visit TechKnitter's site. 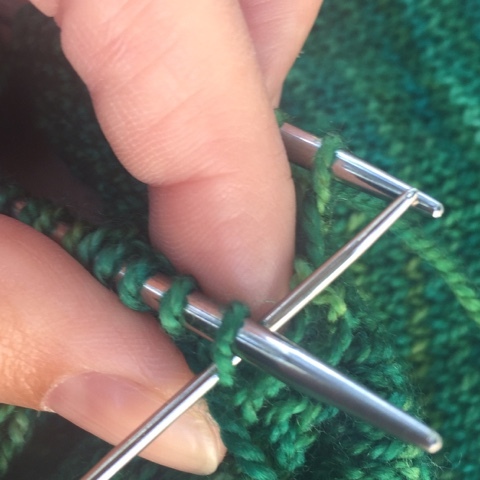 To begin, you slip your held underarm stitches to two knitting needles (or both ends of a circular needle, as shown below). Think of them as the front and back needle. 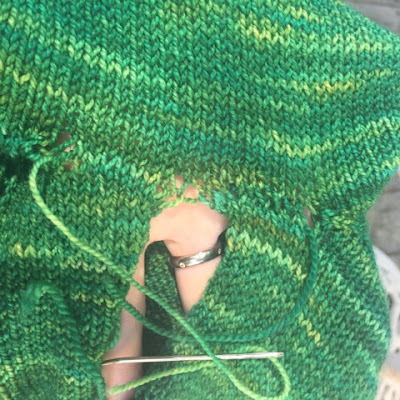 If you are grafting the front/knit side of Stockinette together, you should have the front side facing you. Thread a length of yarn onto a tapestry needle. 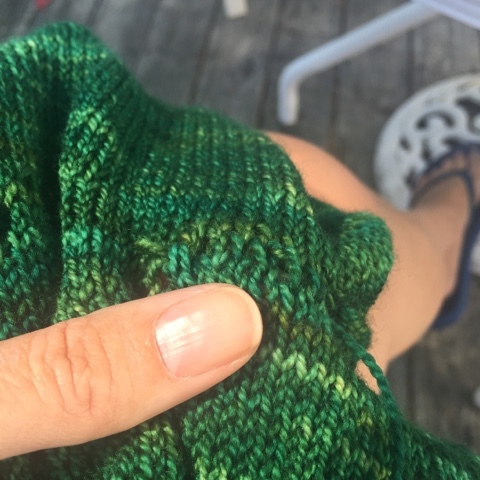 Don't be stingy with the length of yarn! I like to leave at least a six-inch tail at the beginning and then use that to tidy up the "corner". Basically, we are going to lead the yarn in and out of each stitch twice to create an additional row of stitches that bonds both fabrics together. There are two basic moves (through a stitch as if to knit and through a stitch as if to purl), plus taking a stitch off the needle, and two rows to work on (front and back), which tends to mean a bajillion ways to get confused. People tend to get flustered at this point, finding it difficult to remember the ins and outs of the stitches as we move from front to back. Truly, it is simpler than you think. This is not to say it isn't confusing - it definitely can be. The way I remember it is that I always begin the sequence by pulling the tapestry needle through the front stitch as if to purl. With this move we never take the stitch off the front needle. Then we go to the back needle and pull the tapestry needle through the back stitch as if to knit. And, again, if we are knitting the back stitch, it does NOT come off the needle. Now, we go back to the front needle and put the yarn through as if to knit, which means it is time to take a stitch off the needle (yay!). That only happens when you are knitting a front stitch, though. And having done that we have to turn our attention to the next stitch on the front needle and bring the yarn through as if to purl (just like our very first move). Then we go to the back needle and put the yarn through as if to purl, which means it is time to take the stitch off that needle (yippee!). This also means we then turn our attention to the next stitch and bring the yarn through as if to knit (our very second move). 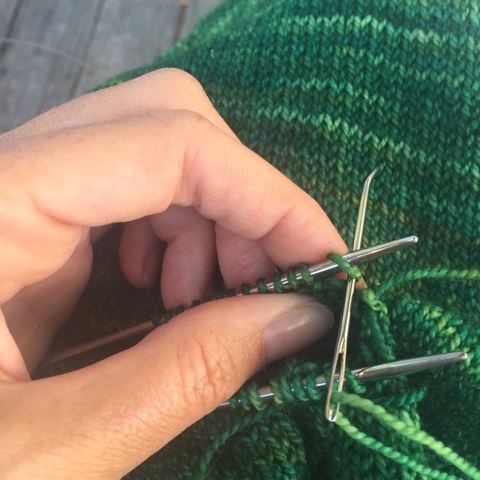 Some people like to think of the above as the preparatory steps to Kitchenering, but I think of them as just part of the whole thing, since we constantly toggle back and forth between those moves and the moves that get the stitches off our needles. After each stitch, be sure to gently pull the yarn snug. Not tight, just snug. If you're worried, you can leave it loose and go back and tighten up the stitches at the end to match the gauge of your fabric. 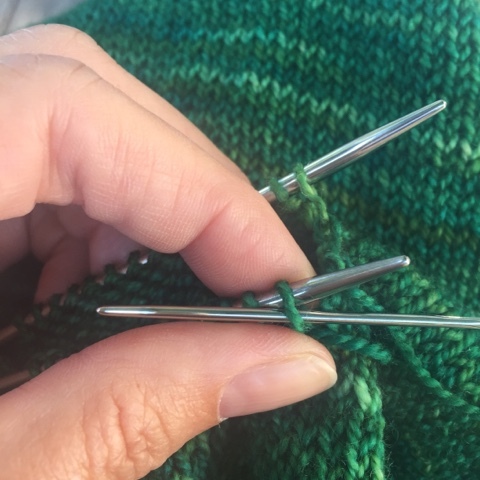 Be sure to keep your working yarn to the right side of your needles. None of this works going over top of the needles. When you have grafted all the stitches together, you can adjust the stitches to match your knitting tension. Then use the tails to tidy up the corners (I have yet to get really scientific about this part and still feel like I "wing it" every time. 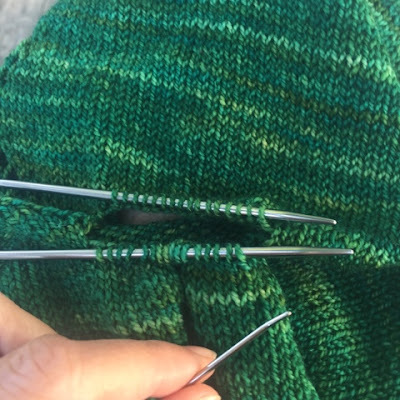 A helpful notion: stitches are only ready to come off the needle if they are being worked as they would be in regular stockinette fabric. That is: stitches on the front needle would be knitted, if we were to continue working them in our imaginations. And stitches on the back needle, if you look closely, are at the top of purled fabric, right? Also, remember that stitches must have the working yarn weave through them twice. Happily, we are in the home stretch on this wedding sweater adventure (whew! ), and next week I'll show you the trick I use when working with teeny buttons. Next step: Buttons, part II.